Chances are good that unless you’re a scholar of Welsh literature, Arthurian legend, or early Scottish history, you’ve never heard of a Welsh poem called “Y Gododdin” (“The Gododdin,” in English). It is the earliest surviving Welsh poem, also known as the “Book of Aneirin.” Written in Old Welsh and Middle Welsh, it tells the story of the historical Battle of Catraeth between the Angles and a motley crew of post-Roman Celts, Picts and Votadini sometime near the year 600 CE. This battle was a historical turning point, one that crushed the Votadini tribe and ushered in the ascendancy of the Angles for centuries to come. There are two different versions of the surviving manuscript (one is shorter than the other, and generally believed to be more reliable). Cardiff MS 2.81, dates to the 13th century, but the poem itself is believed to be much older and may have first been written down in the ninth century from an oral source dating to the seventh century. If historical King Arthur existed, most scholars would place him somewhere between 400-600 BCE, that is after the withdrawal of the Roman Empire from Britain, yet before the rise of the Angles and the formation of the country we now call England. This means that it is possible that Arthur may have lived to see the battle referenced in the poem if the upper end the acceptable date range and the accepted timeframe of the battle are accurate. Whoever the poem is referencing, is good, but he’s no Arthur. Now, the man being referenced might be the king of legend, or he may simply be someone who shares the name or was named after a historical king, much like we name our children after Hollywood stars or saints today. He may have participated in the battle (been the true hero to which this person is compared) or he may have lived long before, but still be the gold standard of warriors. Now, I am not qualified to argue either way whether the Arthur referenced is King Arthur. I’m a fiction writer who happens to do a lot of research, not a trained historian. But I found this reference intriguing and decided to use it to help shape my theory of what happens to Guinevere after the fall of Camelot in my recently-released book, Mistress of Legend, the final installment of my Guinevere’s Tale trilogy. Traditionally, Guinevere ends her days in a convent, but I’ve never liked that ending. It is way too neat and tidy and moralistic for a woman of the Dark Ages, especially my Guinevere, who strong and smart and in no way docile – not to mention a pagan. As she says in Mistress of Legend, “Let those who will believe I died in a convent, but I would complete my life as I had started it—as a warrior’s daughter.” After the Battle of Camlann takes Arthur and Mordred’s lives leaving Britain in chaos, Guinevere returns to her mother’s tribe, the Votadini, who lived in what is today southern Scotland. Because of this connection, having her lead the historical battle memorialized in “Y Gododdin” seemed like a natural fit, especially since the poem mentions that the Votadini leader did not accompany his troops on the actual battle. (You’ll have to read the book to find out how Guinevere finds herself in that position.) I in no way believe Guinevere as the leader to be historically accurate, but it is at least plausible in the realm of historical fiction. But why did such a battle take place historically and why/how could it figure into the events of Arthurian legend? The former is a question scholars have been debating for ages. The much-debated location of the battle is Catterick, quite far south and east of the Votadini lands, so it seems odd that an army would travel so far for a battle. The most obvious answer is that they were going to lay siege to a hillfort or take back disputed or key strategic land, but that is a long journey for such an effort. It could also have been a raid, the like of which was very common in Celtic culture. This type of military expedition wouldn’t have been important enough for the ruler to attend personally, and so it would explain why the Votadini chief didn’t lead his troops into battle. Other theories say it could have been a pre-emptive strike against the increasingly powerful Angles and that Catterick is just where the two armies happened to meet, rather than the original end goal. But I like Jenny Rowland’s theory better. She believes the battle could have begun as a rescue mission to save the author of the poem from prison, which is one of the legendary explanations for the poem’s existence. Similarly, John and Caitlin Matthews note in their book The Complete King Arthur that it may have started as the rescue of a Votadini hostage. I combined these two ideas and made the person being rescued someone we all know and love from Arthurian legend…and also turned it into a major plot twist in the book. That is part of the fun of historical fiction. 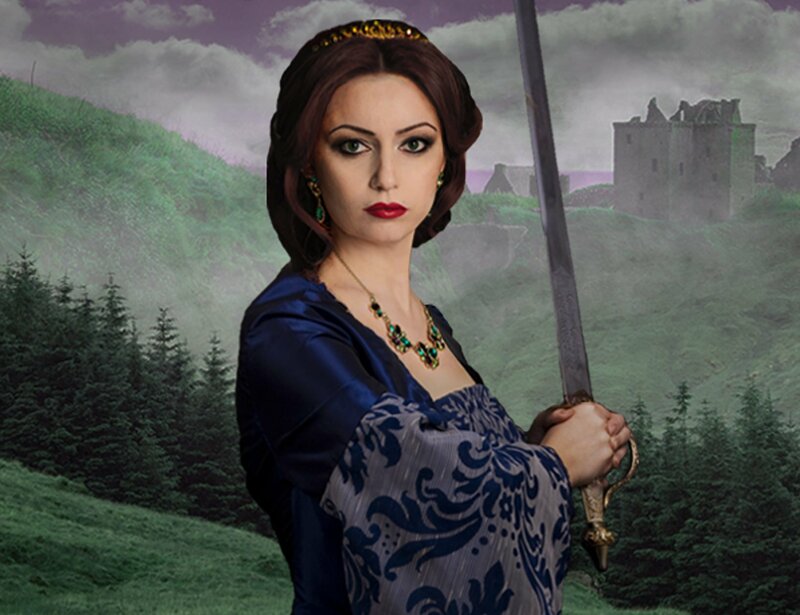 Through this novel, I can help educate readers about a little-known piece of British/Scottish history, but also entertain them by connecting it (albeit loosely) to Arthurian legend and the fictional world I’ve created. I hope that it sparks interest among readers to learn more about the battle and maybe even study the poem itself. Sometimes making history relevant is as simple as showing it as a rollicking good story – one “Y Gododdin” already contains.